Windom Earle takes his chess game "off the board", as he kidnaps Maj. Briggs to learn the secrets of the Black Lodge. Audrey follows her heart, but not all the way to Brazil. Cooper and Annie's burgeoning relationship spells certain doom. Something evil breaks through into the woods. 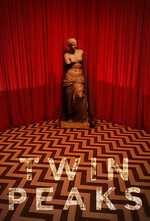 BONUS STUFF: Belgian culture magazine Agenda interviews David Lynch about an exhibition of his photographs in Brussels, the reasons behind his 8-year hiatus from film, and some brief thoughts on the new season of Twin Peaks. I remember watching this when it first aired, and when Windom Earle asked exasperatedly "What is the capital of North Carolina?" Major Briggs and I answered "Raleigh" simultaneously. A couple of things happened in this episode that reassured me that the Twin Peaks writers still knew what they were doing. First, the revelation that last week's "Heavy Metal Youth" was not actually from the town (does metal even exist in Twin Peaks? ), but was a roadie for a touring rock band, thus preserving our sense the local youth culture's native dream-jazz/gothabilly sensibilities. Second was Bobby acknowledging his admittedly scattered motivations over the last 10 episodes or so, and playing it off as his own character's confusion, which more or less convinced me that it was the story arc the writers had in mind after all. And then we've got Windom Earle. I think there's still a lot to like about this storyline, although I agree with the overwhelming consensus that it isn't nearly as effective or mysterious as it should be. FWIW, I think Kenneth Welsh is doing his darnedest to make the character memorable in a goofy Batman villain sort of way -- the mind games are pure Riddler -- and he puts some nice shadings on the pre-insane version of Earle that appears in the Project Blue Book file recording. But on a conceptual level, ultimately Earle isn't nearly as compelling as BOB and the lodge spirits. Pete apparently seeing Josie's face in the Great Northern woodwork. For some reason, I'd thought that the crude CGI shot of the drawer knob a few episodes ago was the only detail that gave a clue to Josie's fate, but apparently there were more. The spooky hand tremors exhibited by several different TP residents throughout the episode. I don't recall if that's ever brought up again, or if it's just a one-episode thing for the opening of the Black Lodge. This episode was directed by Stephen Gyllenhaal, father of Jake and Maggie, who would both go on to costar in a similar small-town paranormal story: Donnie Darko.